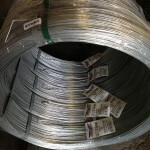 Southwestern Wire Inc produces many forms of tension wire for use with chain link fence and the application of the tension wire will determine which wire is right for the job. With full control of the galvanizing process we control all the tensiles and coatings of the the galvanized strand to ensure workability with out sacrificing your specifications and requirements. Smooth tension wire is most often used for securing the bottom of chain link fence in residential applications. Gauges most often used are 12.5, 12, 11 and 9 gauge. The wire is most commonly coiled in 100 lb coils with five coils per master bundle for sale to wholesale accounts. Most often the wire is manufactured with a Class 3 .80 oz coating of zinc so this wire strand will last just as long as the chain link fence. Wire is manufactured in soft tensile for workability but with enough strength to be stretched for the purpose. 9g gauge tension wire can also be used for bracing in agricultural fencing applications. Also, these wires are also used for other merchant uses such as bracing scaffolding, vineyard applications and other construction related activities. Marcelled tension wire is used in commercial and industrial fence applications both for private and public specified work. Wire produced by Southwestern Wire for this application is 7 gauge (.177 in.) diameter and is produced in Type I and Type II. Type I is Aluminized coated with a .40 oz aluminum coating. Wire being coated to the Type II specification is manufactured in three galvanized coating weights. Type II, Class 3 is .90 oz zinc, Type II, Class 4 is 1.20 oz zinc and Type II Class 5 is 2.0 oz zinc. All of this 7g tension wire material is made to a withstand the minimum tensile requirements of the above specification which is 1950tp. 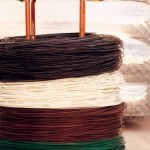 Typical package quantity is a coil containing approximately 85lbs of wire with 1000 linear feet of yield. 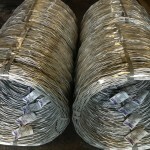 Coils are master packaged in five per bundle for shipment to wholesale dealers of fence materials. Vinyl coated tension wire is used in residential, commercial and industrial fence applications both for private and public specified work. This wire can range from light smooth wire used with non specified residential work to marcelled heavy wire for use in spec work. This wire is produced by a manufacturing process in which a vinyl coating is applied to a galvanized wire core wire. This tension wire is manufactured to specific tensile range other than workability for the contractor installing the material. Most often this wire is manufactured in a 12.5 gauge core or a 11 gauge core with finish sizes of 9 gauge and 8 gauge respectively. This wire is manufactured in extruded product only and most commonly in black but green and brown colors are also availalbe. Special colors upon request with minimum order requirements. These coils are most often packaged in 100 lb coils but also are packaged in 500 ft coils for wholesale distribution. Commercial tension with with a vinyl coating comes in core diameter sizes based on the coating that is applied dictated by the specifications. F 1164 has three Classes of vinyl coating: Class 1 consists of extruding PVC over the galvanized core, Class 2a consists of extruding PVC over the galvanized core while at the same time adhering the two surfaces together with a glue agent, and finally Class 2b of fusing and adhering a vinyl coating to the core wire with either a PVC coating and bonding agent or with a polyolefin elastomer. The extruded tension wires in Class 1 and 2a are made with a 9 gauge (.148) core with a finish size of 6 gauge (.192) diameter. The 2b material is manufactured with a 7 gauge (.177) core and a 6 gauge (.192) finish diameter. Any of these tension wires can be used as smooth or marcelled as per the clients specs. Tensile of the core wire is specified as per F 1664 in that the 9g core shall be a minimum 1290 tp and the 7g core shall be 1950 tp minimum. Common colors are black with brown and green also available. To locate the nearest wholesaler please contact us!